Looking for new pots and pans? Ever felt that sinking feeling on losing half an omelette to a past-its-best pan, or tearing a perfectly formed fried egg at the last minute? Have you ever paid the price for a delicious, ready-in-a-flash stir-fry with hours of scrubbing? Sounds like you need our guide to the best non-stick frying pans. Our list rounds up the best for all budgets and levels of expertise, whether you’re working in a top restaurant or just working on your patented technique for flipping pancakes. What makes the best non-stick pan? Well, if the pans that have made our shortlist are anything to go by, we think the best recipes take a good, robust construction (usually aluminium or stainless steel), add a durable coating (ceramic or Tefal), a comfortable oven-safe handle, and mix. Then, throw in a few trusted brand names and new-on-the-scene movers and shakers for good measure. The benefits are manyfold. Those of us looking to limit our intake of fats and oils will appreciate how easy these slick pans make it to cook with either the barest amount of oil, or none at all. Those of us who, after a long day, balk at the idea of spending hours scrubbing scorched-on food from the bottom of the skillet (that would be all of us, then). We’ve even got those with a growing nervousness about the number of chemicals given off by our cookware covered - scroll down to the eco-friendly and toxin-free options below for guilt-free frying. As you’d expect from Le Creuset, the quality in this pan’s build is tangible, and it has the functionality to back it up too, giving it our top spot in the frying stakes. Its stainless steel handle both stays and looks cool, and is riveted for strength, meaning fuss-free transfers from pan to plate. The hard-anodised stainless steel pan body is incredibly tough, and is durable enough to be used on any heat source, including induction hobs and in ovens, giving it some real lasting power. Unsure about the efficacy of an eco-friendly pan? This GreenPan is a great all-rounder, so there’s no need to worry about sacrificing usability for recyclability. Its hard-anodised base is suitable for all stovetops, including induction hobs. It also has a wipe-clean finish both inside and out, making cleaning up a cinch. Its big selling point, though, is its Thermolon coating: a sand-derived non-stick layer that skips the lead, cadmium and other controversial chemicals in its manufacturing process, a bonus for conscious cooks. A clever combo of steel and aluminium means that the Scanpan feels impressively heavy duty, but light enough to handle easily and walk the walk when it comes to quick and even heating. 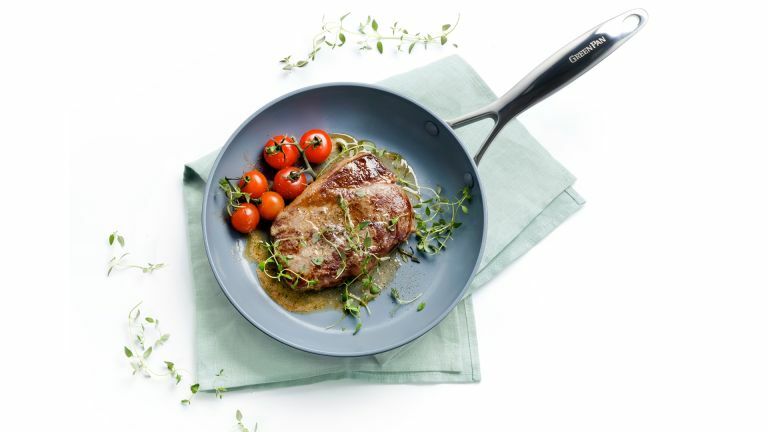 Its special ‘stay cool’ stainless steel handle won’t burn the hands of forgetful cooks, while its GreenTek coating, free from troublemakers PFOA and PFOS, allows the use of any utensil, including the normally-outlawed metal (although we still recommend exercising caution). Tefal’s non-stick prowess is world-renowned, and nowhere is this better demonstrated than in the diminutive One Egg Wonder, which squares up to one of our most notoriously sticky favourites, the mighty fried egg, and wins. It’s surprisingly versatile, too. Cook on the hob and follow up in the oven, so long as you keep it under 180 degrees celsius, and as long as you treat it nicely, that non-stick coating is protected by Tefal’s lifetime guarantee. The Tefal experience is best characterised by the peace of mind it offers, and when it comes to something you use every day, that means a great deal. This pan’s ‘Titanium Excellence’ coating offers ultimate toughness and longevity, and gets extra bonus points from Tefal’s lifetime guarantee (with the proper care, of course); the Bakelite handle is comfortable, secure and oven-safe; and, most ingenious of all, the distinctive ‘Thermospot’, which changes colour when your pan is up to temperature. This colourful pan immediately puts paid to the idea that shopping for pots and pans is a monotonous (and monochrome) experience. Bringing a touch of glorious Technicolor to your kitchen cupboard is the Green Earth Frying Pan, whose green credentials aren’t just on the outside. Like the GreenPan, it’s free from nasties like PTFE, plumping instead for patented GREBLON technology. Plus, its high-quality anodised aluminium construction reduces risk of hot spots, and its magnetised bottom ensures quick heat transfer on induction stoves. The Tower Cerasure Colour Change Fry Pan, has its colour-changing capabilities in common with the Tefal Expertise, making it perfect for home cooks still honing their stovetop skills. This takes all the guesswork (well, almost all of it) out of hob-top cooking, including on induction hobs, with the non-stick lining changing colour as soon as it’s up to temperature and ready to go. The choice of three pan sizes is also a plus: hungry students will find the smaller size a versatile addition to their arsenal, while the 28cm model is perfect for one-pan family dishes.